In falconry, a cadge is a frame on which hawks are carried. In shape, it’s traditionally a square, padded wooden frame on which the hooded hawks perch; it’s hung from a man’s shoulders by straps. Nobody is entirely sure where its name comes from, but the experts believe it was an alteration of cage under the influence of the old verb to cadge, meaning to carry things. A cadger with his cadge. Taken from An Encyclopaedia of Rural Sports, by Delabere P Blaine, 1858. If you trace that verb back, it starts its recorded life about 1600 in reference to men named cadgers in Northern England and Scotland, a noun which is known slightly earlier, from the late fifteenth century. They were itinerant hawkers and peddlers with a horse and cart or a packhorse, who collected butter, eggs, poultry and other farm produce for sale in the local market and who in return took out small items to farms from the local shops. They did not enjoy a high reputation: often hard bargainers and hard swearers (“to curse like a cadger” was once a Scots simile), they were at the bottom of the social order. An old Scots proverb says “the king’s errand may come to the cadger’s gate yet”, meaning that even the highest in the land may sometimes need the help of the most humble. There’s also codger, which often turns up these days as old codger, meaning a man who is mildly eccentric and of mature years. This may well be a variation on cadger that comes through the idea of an old beggar or tramp (at one time in English dialect codger could refer to a disagreeable or miserly old man) but which has softened somewhat over time. 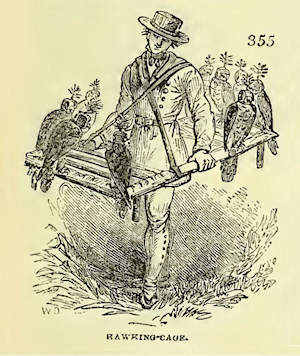 Falconers sometimes like to say that their cadge is linked to the verb to cadge and also to codger, since those who carried them were often old men good for nothing better. Though it’s true that the man who carried the cadge was indeed a cadger, there’s no direct connection between it and codger, nor with the modern sense of somebody who likes to get something for nothing. Last modified: 15 January 2005.